The first Leica SLRs that came out in the 1960s — the all-mechanical Leicaflex series — were designed and made by Leitz Wetzlar in Germany. However, by the mid-1970s it was clear that the electronic auto-exposure SLRs made by Japanese companies were superior in cost, size, weight, and usability. In response, Leica teamed up with Minolta and used technology from the Minolta XE/XD series to come out with the electromechanical auto-exposure Leica R3, followed by the R4 and R5. However, Leica has one of the most obstinate, anti-technology user base imaginable. There are still many who think the Leicaflex SL2 (or SL) is the greatest SLR ever made (I'm talking about you, Doug Herr.. ;-). The R4 and R5 did not sell well. Back to Basics: To please their base and to prove that Leica was capable of making an all-mechanical SLR on their own, Leica designed and produced the Leica R6 in 1988. The Leica R6 is an all-mechanical, manual metering single-lens reflex camera. 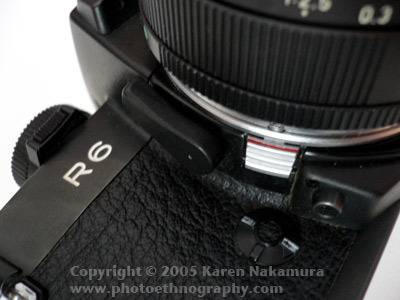 Unlike the R3 through R5, the R6 shutter is mechanically timed. The meter* is the only thing being powered by the batteries. Without battery power, the meter will not work, but the camera is otherwise fully functional. With their intricate clockwork timing mechanicsms, mechanical shutters are expensive to make. For example, a new R6.2 was more expensive than the much higher-tech R8! Tough as nails: Part of the R6/R6.2 appeal is their extreme toughness and reliability. They perform just as great on the top of the Himalayas as they do in the Saharan desert. With electronics only for the meter, the R6 will run just fine in the rain or extreme cold. If it runs out of batteries or shorts out, the only thing that will be affected is the meter [and self-timer]. You can keep on firing. At 625 grams, the R6 is also small and relatively light -- just a few grams more than the Leica M6. Many now think the R6 and its slightly updated sibling, the R6.2, are the best mechanical SLRs ever produced, ever. Of course the Leicaflex SL afficianados and Nikon F4 fans might have something to say about that. Famed documentary photographer Sebastio Salgado is a Leica R6.2 user. But the era of the mechanical SLR is over. They were just too expensive to produce. 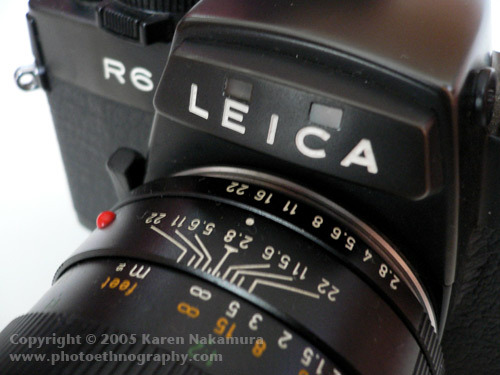 The R6.2 cost just as much as the R8 and Leica ultimately discontinued it due to faltering sales. The last film SLR in Leica's stable was the R9 -- which was fully electronically controlled. R4 1980-85 A smaller camera based on the Minolta XD series. The first units came with many bugs that marred its reputation, see Doug Herr's R4 page for more info about which serial numbers to avoid. R6 1988-92 A return to the all-mechanical SLR. No auto-exposure, manual metering only. R6.2 1992-97 Improved R6; top speed increased to 1/2000 sec. R7 1992-97 A redesign of the R5, electro-mechanical and auto-exposure and program modes. R8 1996-02 A totally new design by Leica, much larger and heftier than the earlier R series, with a totally new line of accessories. Spot, center, and matrix metering. Can even meter studio strobes! The R8 is almost fully compatible with the new Digital Module R (DMR) 11-megapixel digital back. R9 2002-09 The latest R system camera. A slight modification of the R8: 100grams lighter and digital-ready (some think it should have been called the R8.2). Perfection indeed, if you have forearms of steel, don't mind manual focusing cameras, and love R-glass. 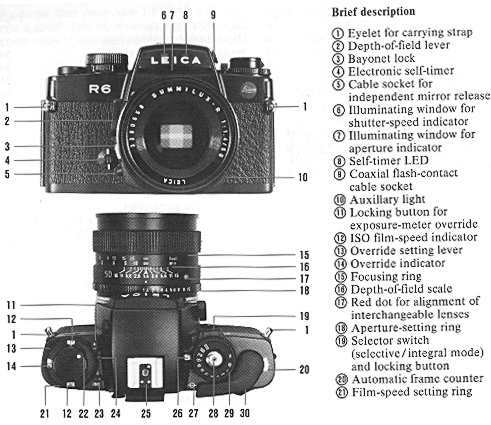 Like with many Leica cameras, there were some minor revisions of the R6 during its production. Most notably the ISO film speed dial was modified so it was slightly easier to read the numerals in dim light. The R6.2 is essentially the same camera as the R6, the major difference is the maximum shutter speed was raised to 1/2000 sec. from 1/1000 sec. 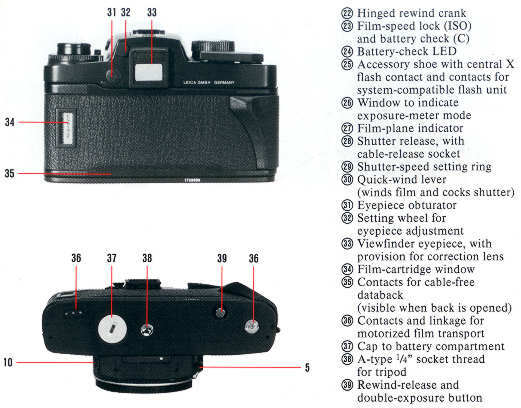 There are a couple of other minor differences too (Leica FAQ). 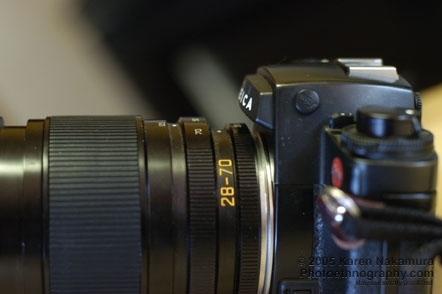 For the most part, this page talks about the R6 and the R6.2 as if they are the same camera. The R6.2 was only discontinued in 1992, despite the R8 and R9 being sold at the same time. Some prefer the simplicity, ruggedness, and small size of the R6 series; and others prefer the ergonomics and advanced metering and shutter design on the R8/R9, which have a 1/8000 top shutter speed — as well as the option of putting Digiital Module R (DMR) backs, essentially converting their R8/R9 into digital cameras. Leica R6 manual scans courtesy of David Young. The R-series cameras including the R6 use only the so-called "R-cam" or third stepped cam on Leica R lenses. 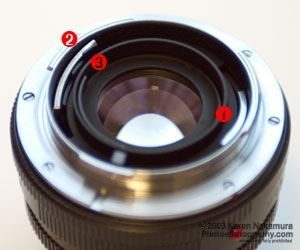 There are R-only lenses that only have the R-cam. You can of course use these without only problems. 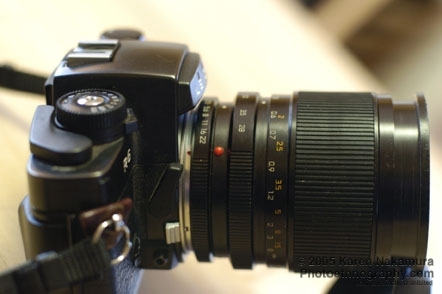 If you use an older Leicaflex 2-cam or 1-cam lens, you'll have to use stop-down metering. Just push in the DOF preview lever and meter while stopped down. It's not as hard as it sounds. ROM lenses designed for the R8/R9 also contain the third-cam (R-cam) so they can be used on all R series, but they can't be used on the older Leicaflexes. 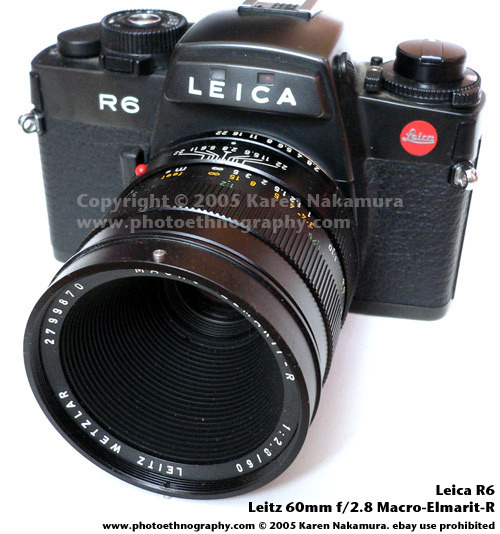 More info on my Leica R lens page. 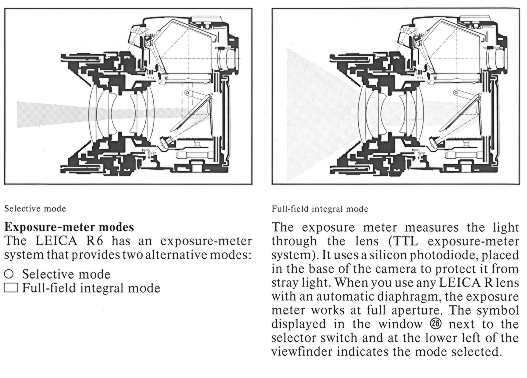 Full-field Integral vs. selective metering: The R6 has two metering modes. 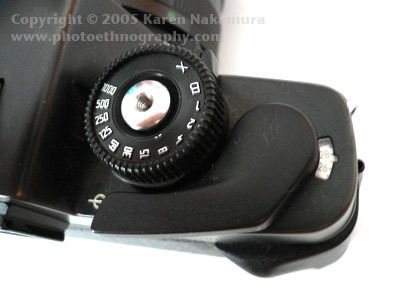 The lightmeter/power-switch is located beneath the shutter-release/shutter-speed dial. The switch controls the selective or integral metering mode. Full-field integral is unique because it covers the entire field evenly, i.e. it's not center-weighted. 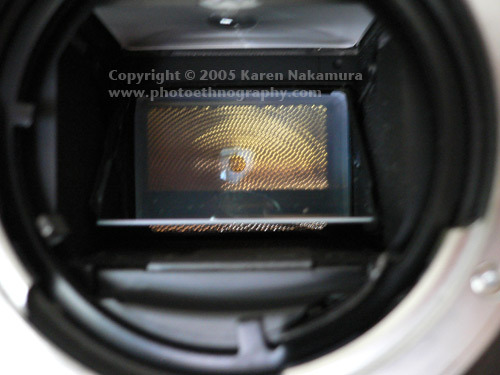 You can see the unique gold-colored full-field metering pattern through the lens mount. 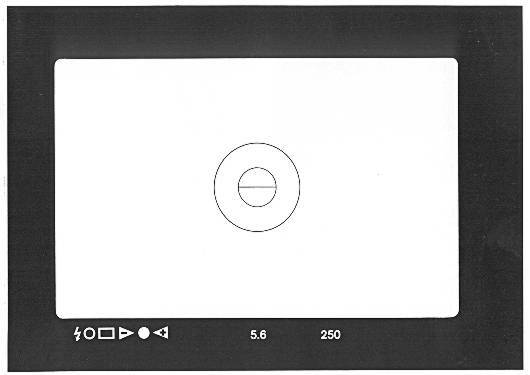 The selective metering meters only the small portion of the scene as indicated by the outer frame of the focusing circle. It's a bit bigger than a pure spot-meter but is eminently usable. Eyepiece shutter: The R6 has an eyepiece shutter (which only a few high-end SLRs have). If your eye is away from the shutter and you meter, stray light can enter through the eyepiece and through your metering off. Very few SLRs have this - most notably the Nikon single-digit F series and the Canon EOS 1 series. It's not as important with the R6 since it's manual metering only. Built-in Diopter Correction: Yanking the small dial next to the viewfinder out will let you correct the eyepiece diopter from -2 to +2. This is enough range for minor short or farsightedness, any more than that and you need to get a custom eyepiece made by your optician (or use your glasses). Battery life: Leica says that two SR44 silver-oxide batteries or single lithium CR1/3N will power the meter on the R6 for 2500 exposures or about 70 rolls. The battery check button (marked 'C') is next to the ISO speed dial. Pressing it down with your fingernail turns on the self-check. If the red LED in front of the check button stays on for more than 5 seconds, the batteries are still usable. If it grows faint or doesn't light, the batteries are dead. Without batteries or with dead batteries, the R6 can still be used at all shutter speeds. The only thing that won't work is the meter. Mirror Pre-Release: The R6 has a mirror pre-release feature. It requires threading a remote cable-release into the small socket by the lens mount (item #5 in the manual diagram at the very top of the page). Nemeng's Leica FAQ has a great hack involving a paper click which works just great. Missing Master 'OFF' switch: There is no shutter-lock switch! You can turn off the meter and lock it off by turning the integrative metering selector all the way to the left, but that doesn't affect the shutter release. You'll get a lot of photographs of the inside of your camera bag until you realize this. Self-timer: Although it looks somewhat unorthodox (a flattened dial switch), the R6 has an electronic self-timer dial in the same place a mechanical self-timer lever would be on a mechanical camera. Turn it clockwise for a 9 second release delay. The self-timer requires battery power. Multiple-exposures: Unlike earlier Leica SLRs which had dedicated multiple-exposure switches, you activate multiple exposures by pushing in the rewind release button after taking a shot. This lets you wind the shutter without advancing the film. The rewind release button will automatically pop-out after the shutter is cocked. 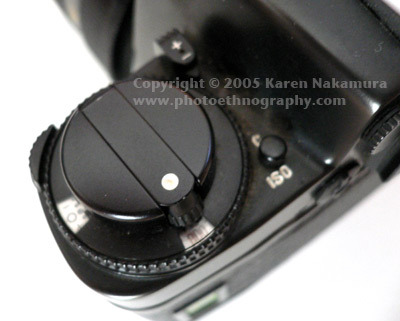 Aperture illumination switch: The R6 shows the lens aperture in the viewfinder by means of a little window above the lens mount (much like the Nikon F series). If it's dark outside, it can be difficult to see the lens aperture. There's a small switch on the bottom left hand side of the lens mount that will illuminate the lens aperture by means of a small LED when the meter is activated. Don't leave the switch on by mistake, or you can entirely run down the batteries! TTL Flash: The R6 has an 1/100 sec X sync. As you can see from the photograph above, the R6 sports a flash hot shoe with extra contacts for SCA 350/351/550/551 compatible flash units. Unfortunately, the Leica SF-20 which is designed for the M6-TTL/M7 does not work with the R6/R6.2 cameras. There's a thread on Photo.net discussing this issue. I think the TTL flash of choice is the Metz 32MZ3 or Metz 54MZ4. B&H Photo Video has a nice chart describing Metz flash compatibility with Leicas. Leitz was originally a microscope and scientific optics company. The first series of screwmount Leicas were designed by Oskar Barnack and have been named Barnack cameras by some. The prototype Ur-Leica was designed in 1918, but mass production did not start until 1925 when the Leica I came out. I have a write-up of the Leica III (1933). The Leica M3 rangefinder was released in 1954 and represented the end of the Barnack-series of screwmount Leicas. The M-series had an integrated viewfinder/rangefinder with automatically switching projected framelines, coincident and split-image rangefinder, lever wind, hinged rear door, integrated shutterspeed dial, and M-bayonet mount. I have write-ups of the M3 (1954), M2 (1957), MD (1963), and M7 (2002). The Leica CL (1973) is technically not an M-Leica but it uses the M-bayonet mount. The design of the Leica M has not changed considerably since the M3 of 1954. In 1967, the M4 came out with a crank-rewind instead of a knob rewind. Since then, the M series remained essentially unchanged from the Leica M4 (1968) up to the current M7. 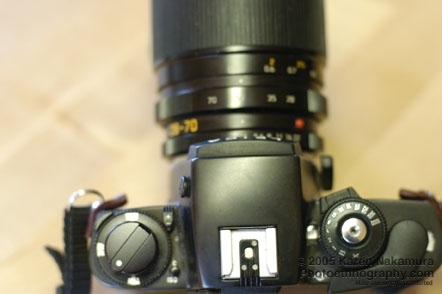 The only difference is that the M7 has an electronically controlled shutter and automatic exposure metering. (This leaves out the fiasco of the M5 which was considerably different and considerably unpopular at the time). Leica's single-lens reflex (SLR) cameras have not been as popular as their rangefinders. I have write-ups of the original Leicaflex SL camera as well as the newer R3 and R6 SLRs and the R-mount lenses. Leitz... blah blah.... and in 2000, fashion conglomerate Hermes bought 31% of Leica's stock. The only tangible result of this has been the emergence of the Hermes Special Edition Leica MP, dressed in the best coach leather and costing a mere US$8000.